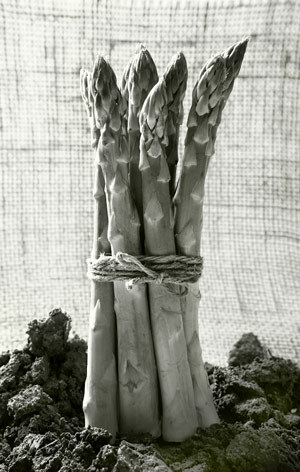 Today I have photographed asparagus. I’ve never been keen on it as a food, but I was in the supermarket last night looking at clinically perfect peppers and saw bunches of asparagus and thought – kill two new year resolutions with one stone – more photography and more cooking. The peppers didn’t have the shape to fulfil my desire to replicate the Edward Weston Classic and I’d seen asparagus photographed before in bunches. As I want to eat healthier this year and these shoots have essential nutrients it all made sense. The trouble is today I had one hour after work to shoot the pic before cooking tea. So a tight squeeze but I got my shot. I placed them upright in some soil, stuck some Hessian as a backdrop and lit them with the studio flash from behind left. A small reflector added fill in front right. It was taken with the Pentax K20D and a 100mm Macro. Converted to black & white using Lightroom.